Uglyworld #534 - Homeward Bound (135-365), originally uploaded by www.bazpics.com. With it now being Saturday we've checked into our hotel in Ashford, England so that we've only a 25min drive to the ferry at Dover tomorrow morning. 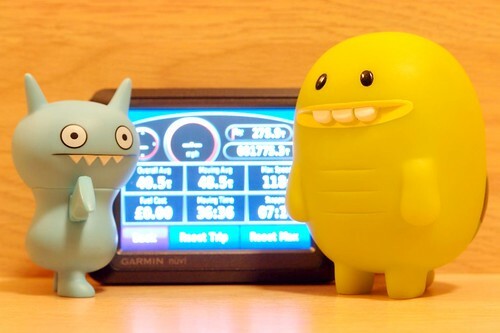 Ice-Bat and Turtle decided to already program the navigation system with the details for tomorrow morning, and both of them were amazed when there was only 275 miles being left to drive tomorrow once we arrive at Calais in France. The homecoming however will be very short-lived as we get back to Aachen mid-afternoon tomorrow (Sunday) and I leave first thing on Monday morning to fly to the USA for 2-3 weeks, so unfortunately my somewhat erratic uploading and commenting could possibly continue through to the 30th May when I fly back to Germany again for a few weeks break. Rest assured, Turtle will be coming with me to America too (along with a few other friends)!! !